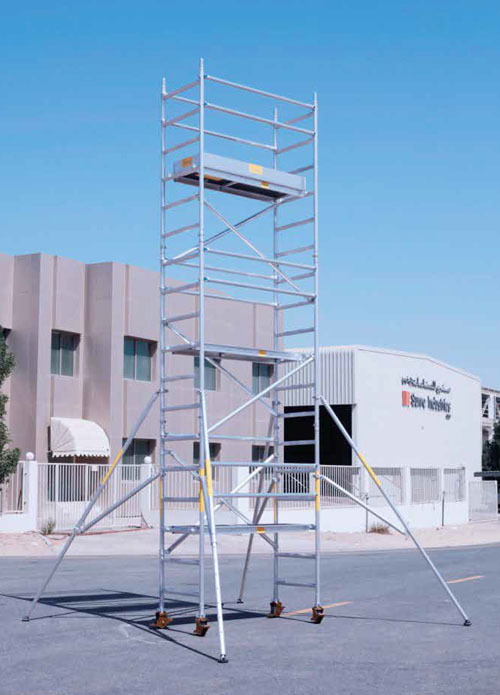 Tower offers an excellent solution with its 78cm wide frame. Length available 158 cm, 178 cm, 208 cm and 255 cm. Maximum Working Height for interior and exterior work is 10mtr. Maximum Load per platform is 225kgs. And for the entire tower is 600kgs. including tower self-weight. The platform hook of the tower is equipped with windlock system. Deck board edge protected by Aluminium Deck Profile. Easy to use toe board system. The frames connection has locking pins to prevent accidental removal of frame. Spigot connecting the tower frame components is neither bolted nor crimped loose component, like many traditional scaffolds, but the vertical tube of 2.5mm thickness is used, to give maximum strength to the tower structure and spigot is an internal part of this same vertical tube designed by cold forming. Equipped with construction manual and labels.